It’s summertime and although you’ve dedicated a lot of time and effort to your family to do list, you find it crumpled in the back of your junk drawer. With a deep sigh, you pull the list out of the drawer and ask yourself, “Is it really important for my family to spend time together this summer? We are so busy doing our own activities!” The answer is yes. Family time is critical in developing a child’s social and emotional health. Another key ingredient in making the most out of family time is to be present when you are with your children. Now get that to do list back out and try some of these fun summer routines! 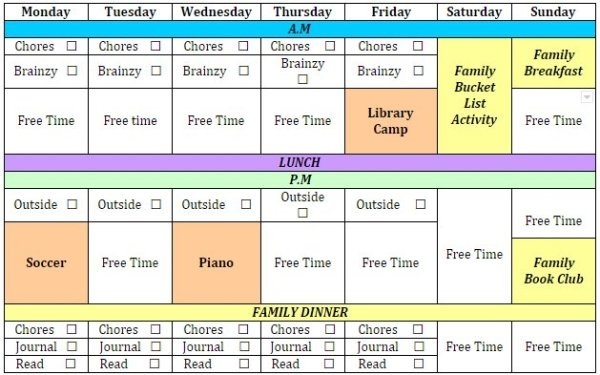 Design a consistent, structured family schedule that allows your family members flexibility and choice as well as scheduled times for family togetherness and educational activities. The American Academy of Pediatrics (AAP) believes in the importance of family routines and suggests children do the best when the routines are predictable. Place your family schedule in a clear plastic cover and display it in a high traffic area in your house (for example: on the refrigerator or a cork board). Give each of your children a special whiteboard marker to use as they accomplish the “must dos” for the day. See the example family summer schedule below. Family togetherness activities are highlighted in yellow. Say NO to increased screen time! When children are introduced to high amounts of technology at an early age there can be long lasting negative effects. The American Academy of Pediatrics speaks up about some of these harmful effects including trouble concentrating, communicating, impeded vocabulary development, childhood obesity and sleep disorders. One way to increase the benefits of screen time is to offer fun educational solutions like Brainzy, an online learning program designed to help early learners build math and reading skills! Set up a consistent and fair routine surrounding technology use in your home and stick with it. Some general guidelines include no screen time before bed and limiting screen time use to 1-2 hours per day. Instill a love of reading outside the classroom with this fun summer idea! Book clubs are very popular with friends, colleagues and in the classroom, so why not delve into a good read with those you love? Set up a time to go to the library together as a family or search family friendly reads online. Next, choose a book that interests you! Remember to be flexible. With multi-age children, you may switch from picture books to chapter books throughout the summer. Buy notebooks for each family member that can be decorated and used for making connections, comments and visuals. Purchase a cheap basket or bin to organize your supplies. Keep markers, pencils, erasers, stickers, and other creative supplies in your bin. Name your book club. Deciding on a fun, catchy name will foster even more togetherness! HAVE FUN! The purpose of your book club is to enjoy your family while you instill a love of learning. Try not to “quiz” your child and listen mindfully to her ideas and connections. Get up and moving this summer! Nature is the perfect place for families to explore, create, connect, learn and play. Recent studies show that a child’s emotional and physical health can be greatly improved by connecting with nature, according to the National Association for the Education of Young Children (NAEYC). These benefits include instilling a calmness and love for beauty, exposure to living things and promoting curiosity and exploration. Children are also more likely to take risks and try new things when spending time outdoors. Try some of these go-to outdoor activities today! Gather your family in a common area and brainstorm all the things you’d like to do together as a family this summer. These should include easy-to-plan activities like beach time, game day, lemonade stands, bicycle rides, pool days, etc. Write your ideas on the small pieces of paper or popsicle sticks. When you are finished, put all of the slips or sticks in your bucket. Dedicate one day per week/every two weeks to your family bucket list. Take turns shaking up the jar and choosing one of the activities. These bucket list activities will have your children looking forward to spending time with the family all summer long! Dedicating time to family togetherness activities this summer will create a stronger community of trust, connection and kindness in your home. Once the bustling school year begins, your family will be more likely to continue the already established routines! April Brown is an innovative educator with a background in Special Education and Psychology, with over ten years of diverse teaching experience spanning three countries. April encourages her students to become healthy, environmentally-aware citizens and make a difference in the world through student-led inquiry, art, theater, and nature exploration. April is currently earning her M.A in the Experienced Educators Program at Antioch University of New England, with a focus on Mindfulness. She resides in Placencia, Belize with her family. Check out her website for more of her ideas.